She used to want to sit in coffee shops and write poetry about the people she would see there. She often thought she would like her lover to come with her. There was a picture in her head. Her lover sat with some Serious Work of Nonfiction, scribbling notes in the margins with a slightly-chewed yellow pencil. She sat with a leather-bound notebook, its pages coming loose so that she had to hold it together with a wide, red rubber band. There would be a knitting group in the coffee shop on Tuesdays, and she would write a delicately brilliant poem about the tattooed man in the leather jacket knitting a sweater for his dog to guard it against the pending bitter Chicago winter. She would show it to her lover, and he would gladly take a break from his Serious Work of Nonfiction to smile over the clever way she made knitting into a metaphor for the biker man’s life. The only problem with this perfect picture was that her lover never wanted to go to coffee shops with her. In fact, he never once came with her. And even if he had gone with her, he didn’t much care for people, so he would have spent the evening ignoring his Serious Work of Nonfiction to criticize everyone around him. Especially the man in the leather jacket knitting a dog sweater. And, occasionally, her. And so she never went to coffee shops. Not even once. She did not buy a leather-bound notebook that would eventually need to be held together with a red rubber band. Then the day came when she let him let her go. She was without a lover. Without any coffee shop poems. Which was just as well because she had no place to put any such poems anyway. So she wandered the streets of Chicago until she got brave enough to go in a coffee shop. It was a Thursday. There was no knitting group. And all she had to write on was the back of a grocery store receipt. She hated her first poem about the mime on his coffee break, arguing with a customer service rep on the phone about a discrepancy in his phone bill. She felt the presence of the empty chair across from her. But she went back. 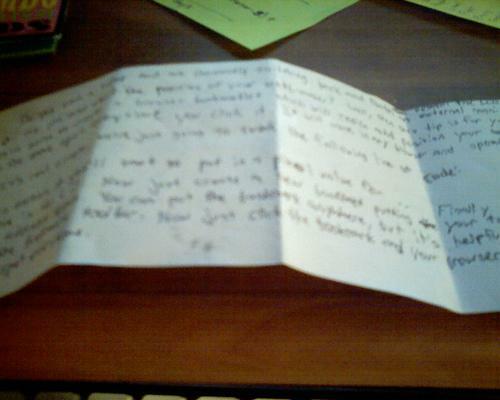 And soon she had a whole manila envelope of poems scribbled on the back of receipts. She barely gave the empty chair a second thought. Until it wasn’t empty anymore. And she was surprised to find it was filled by a new lover. This one did not read Serious Works of Nonfiction. He instead did crossword puzzles in red ink. He was left-handed and so always laid his right hand across the table to hold her left while they worked. He liked the mime poem. He smiled at everyone around them. And somehow this made an even prettier picture than the one in her head. This entry was posted in Issue 10:3 and tagged Diane D. Gillette, Flash by TC Editors. Bookmark the permalink.